Both deregulation in the electrical supply industry and the creation of new electricity markets present electric utility companies with the challenge of becoming more efficient without compromising quality of service. 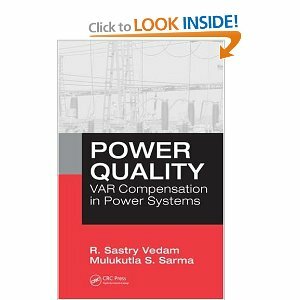 Providing new solutions for this newly deregulated paradigm, Power Quality: VAR Compensation in Power Systems presents comprehensive coverage of power quality, harmonics, and static var compensators in one single volume. The book explains how to ensure that power quality is not affected by the harmonics generated by power electronic equipment and explains how to reduce labor costs and increase reliability of supply by employing a single pole autoreclosing scheme. It also addresses how to analyze frequency response of current transformers and voltage transformers while measuring harmonics. Based on the authors’ extensive experience in the electric supply industry, Power Quality enables engineers to meet the demands of increased loads, strengthen their transmission systems, and ensure reliable electric supply. POWER QUALITY VAR COMPENSATION IN POWER SYSTEM DOWNLOAD LINK!! !